I’ve recently become a huge Matt Bernson fan because the Isis I purchased a few days ago had the most amazing leather cushioning and was uber comfortable. I had hoped this comfort would translate into some really cute wedges for summer and purchased the Matt Bernson Citro Wedges from Zappos. Gotta love free overnight shipping. 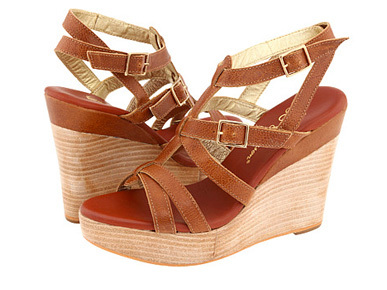 They look so rich and summery, but the pebbly tan leather and wooden wedge heel give it that earthy vibe. Plus look at that thick leather cushion inside! They are extremely comfortable. 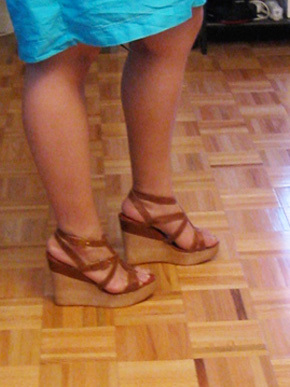 Barely feel like heels. The straps in the back help keep the heel on, so even though they are tall wedges, they don’t flop or clunk around and instead feel securely on your feet. They move with your foot and feel almost like flats. Incredible really, especially for a designer who doesn’t even do marketing about comfort or “new technologies” like Kenneth Cole’s 925 Silver Technology. They don’t need to scream to the world about how comfortable they are, because anyone who tries these will be a fan for life (or until the quality changes). 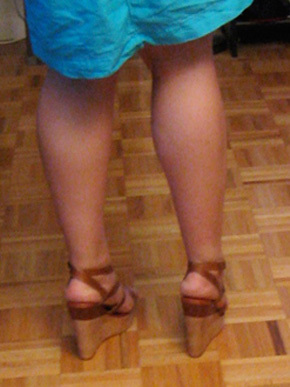 This kind of comfort in a 4″ heel is kind of ground-breaking. I only have a few small complaints. I had ordered a full size up from my normal size and I still felt like my toes were hanging off the edge a bit. The straps, again, like the Isis, were way too short and I could only buckle them at the last hole, which made them kind of tight and constricting on my ankles. 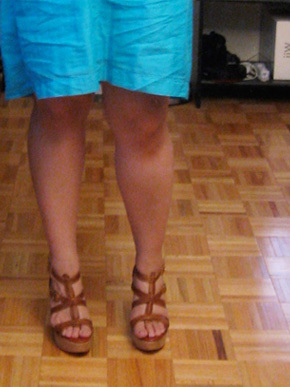 The front also felt a bit narrow and I don’t think my feet are considered “wide” so that’s a bummer. Other than that, I’d really like to keep these, but the tightness makes me question whether this would be a good investment. Get them here from Zappos (love the free overnight shipping “upgrades”) for $191.